As Ray Shea first walked the 250 acre property that included a dairy farm in New Egypt, New Jersey with its fertile, sandy soil, he noticed a rise sloping sharply toward a drainage basin. He then began comparing characteristics of the property with knowledge he had recently acquired about ideal growing conditions for grapes. “I remember pointing, ‘That’s where the pond is,’ said Mr. Shea, a property lawyer. “That’s where the vineyard is. That’s where the winery should be. I learned that through my feet. You don’t totally understand a piece of property through your head and eyes. You have to use your feet.” Mr. Shea bought the land in 1990. In 1998, partnering with his friend, James R. Johnson Jr., a site contractor, they measured off 20 acres and began planting European vinifera — chardonnay, cabernet franc, cabernet sauvignon and merlot. 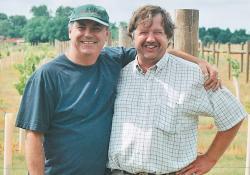 Four years later, they marked off 20 acres and planted pinot gris, lemberger, chambourcin, Norton and zweigelt. In 2003, their first two wines were merlot and chardonnay. On Sept. 20, 2008, Mr. Shea and Mr. Johnson opened the Laurita Winery to the public, joining the growing New York region wine industry. The name, Laurita, combines Mr. Shea’s mother’s first name, Rita, and Mr. Johnson’s mother’s first name, Laura. 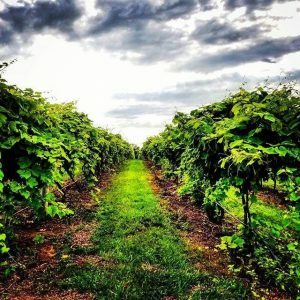 The Laurita Winery is known for it’s beautiful vineyard scenery and elegant outdoor space – exposed wooden beams, two fireplaces and a large wrap-around terrace that overlooks the vineyard. Perfect for weddings and events. In 2002, they renovated and opened Dancer Farm Bed & Breakfast, a circa 1837 historic home. In June 2011, Mr. Shea and Mr. Johnson renamed their Bed & Breakfast to the Inn at Laurita Winery. The Inn shares the same land, a half a mile down the road from the Winery. Ray and Randy spent many years collecting antiques that embellish the history of their unique property. Their current Innkeeper, Janis Bonavito, is the former owner of the popular American Bakeshop’s Daily Grind and Savory Café in Ocean Grove, NJ. She brings her years of experience in the hospitality industry (along with her acclaimed baked goods of course!) with her to the Inn. Janis also operates The Spa at the Inn at Laurita Winery, located on the Inn’s property. She is known for her attention to detail when it comes to insuring her guests are happy and relaxed. Janis and her team at the Inn make your stay a memorable one, whether it’s a girls weekend away or a romantic getaway. Traveling to the Inn and Winery is a serene ride, as you’ll pass the numerous produce stands and farm lands that dot your route. We hope to see you soon.